As an investment and workaround to installing a permanent hot tub, finding the best inflatable hot tub can become a stressful event. There are so many options to choose from, and when considering a large point in interest for buying one is to use it as a stress-reliever, the whole thing can become a huge bummer. Help is here! In an attempt to make things easier for you, we’ve done some research and came up with our Gold Pick, Silver Pick, Bronze Pick and Budget Pick. Hopefully, with a little information, and keeping a few key considerations in mind, finding the best option for you might not be as much of a chore as it could have been. Here are our top picks of this years inflatable hot tubs. If you’re looking for a model that can hold up to six adults, Coleman Lay-Z Spa Inflatable Hot Tub is capable of doing just that. It measures 71-inches by 71-inches by 28-inches – a large, round shaped tub capable of holding more than 250-gallons of water at about just 80% full (you wouldn’t want to fill it up much more than that). This inflatable hot tub is ETL Certified. This means that the product adheres to the accepted product safety standards that are determined through independent testing and periodic follow-up inspections by an NRTL (Nationally Recognized Testing Laboratory). This gives you the peace of mind that the product has been tested and is considered safe by knowing parties. The Coleman Lay-Z Spa is made with a mosaic printed TriTech 3-ply reinforced material that features a polyester mesh core encased in two layers of PVC for extra strength and durability. The material is leatheroid in texture and is puncture resistant. A really cool feature of the Coleman Lay-Z Spa Inflatable Hot Tub are the walls. This is because they are made with a special I-Beam construction that makes it possible for people to sit on them without worry of the side collapsing, deflating or concaving. At the base of this inflated hot tub is a separate air pad cushioned floor. This cushioned floor sits underneath the spa adding extra comfort for your feet and backside. Along with giving the hot tub additional comfort, the separate air pad helps with insulation and minimizing the loss of heat through the base of the spa. This hot tub comes with a digital control panel. This control panel has an automatic start/stop timer-controlled heating system. The heating system allows the water to go up to a comfortable and relaxing 104-degrees. The digital control panel also works the 120-bubble jets placed throughout the hot tub. This give you’re the choice of whether you wish have a soft bubble massage or to just soak in the relaxing hot water. To ensure the heat stays in the hot tub, the Coleman Lay-Z Spa comes with an insulated cover that has an aluminum foil coating to help in keeping the water extra warm. Along with the insulated cover, the Coleman Lay-Z Spa Inflatable Hot Tub comes with their rapid heating system and the integrated water filtration system with filter cartridge – a type VI cartridge. It also comes with a ground cloth, inflation hose, a chemical floater and a heavy-duty repair patch. The easy to follow maintenance guide and instructional DVD make setting the Coleman Lay-Z Spa up a breeze. You can use this inflatable hot tube both indoors and outdoors. This is convenient if you have a spa room in your home or if you wish to place it by your pool. Also it allows you the convenience of using it year around if placed indoors. Additionally, the Coleman Lay-Z Spa Inflatable Hot Tub comes with a limited warranty. This warranty starts from the date of purchase and protects against defects in material and workmanship. You need to keep the original receipt and be the original purchaser as the receipt is considered non-transferable. 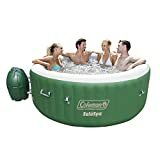 For more specific terms and length of warranty, each product comes with full details of the warranty for their specific product.Customers who have purchased and used the Coleman Lay-Z Spa Inflatable Hot Tub have generally left positive feedback. Customers really like that it is both a fast and easy set up process. Most customers report that the spa is a great choice over buying a much more expensive conventional hot tub. With this being said, some customers noted that this inflatable hot tub seems to lose heat when the bubble feature is on. Other customers disliked that you can’t use the Coleman Lay-Z Spa (outdoors) when the outside temperature is below 40-degrees. Several customers who experienced problems with their hot tub noted that the warranty and customer service process is difficult as it seems that the product is actually a Bestway product with a Coleman stamp.The Coleman Lay-Z Spa Inflatable Hot Tub is a more expensive choice, but comes with several cool features which makes the price possibly worth the expense. Another great inflatable hot tub to check out is the Intex 77-Inch PureSpa Portable Bubble Massage Spa Set. It allows for up to four adult people to relax in and when inflated, it measures 75-inches by 75-iches by 28-inches – obviously not the 77-inches is states in the title when inflated, but still a large round tub – and holds around 210-gallons of water.What’s really cool about this inflatable hot tub is the built-in hard water treatment system. This system makes the water you fill the inflatable hot tub with gentler on your skin, clothes and the entire spa. Hard water tends to build up and then limits the water flow and can ultimately reduce the life of your spa. This system generates an electromagnetic field that agitates calcium and other minerals in the hard water and causes them to create suspended crystals. Those crystals are then retained in the filter cartridge, leaving you with soft water for your spa. 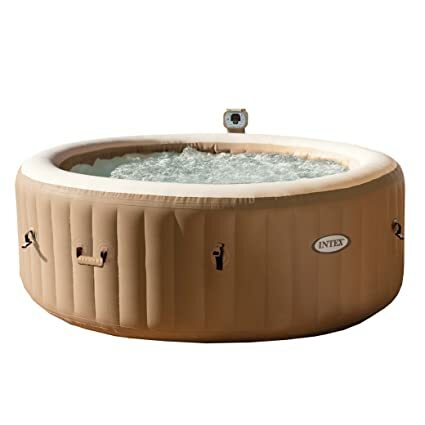 The Intex PureSpa is made with a Fiber-Tech Construction and puncture resistant 3-ply laminated material. The Fiber-Tech Construction is designed to offer structural stability while maintaining a comfortable surface. 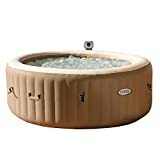 The lightweight high strength fibers add amazing strength and durability to the spa as you’re able to sit on the walls of the inflatable hot tub without worrying about them collapsing or concaving.Like the Colman Inflatable Hot Tub, the Intex PureSpa Portable Bubble Massage Spa Set has a digital control panel. This control panel is easy to use and regulates the heat of the inflatable hot tub. You can set the temperature as low as 68-degrees, which is a more pool-like temperature. Or you can go as high as 104-degrees which is a more relaxing heated temperature for the soothing spa. Also, the digital control panel controls whether the 120-bubble jets are on or off giving you the option for a soft massage or just soaking relaxation. This inflatable hot tub comes with grab handles on its surface that make moving it around and positioning it easier. It has an insulated top cover with an attached lock. This adds a safety and security element that is a nice feature, especially when considering homes with children. It also comes with its heating system, a 3-way Test Strip (to check that the chemical content of your water is balanced), two filter cartridges, a floating chlorine dispenser, a thermal ground cloth, an inflation hose and a carry bag. The carry bag is especially a nice feature as it allows for a safe storage solution if you choose to drain and deflate the product.You can use the Intex PureSpa Portable Bubble Massage Spa Set both indoors and outdoors. Again, this is great if you have a room you are making into a spa and can be used year round, or if you just wish to have it placed outside on your deck for use. The warranty on the Intex 77-Inch PureSpa Portable Bubble Massage Spa Set is more like an extended return policy. This is basically stated within the warranty itself. All the informational details come with the product packaging and remember to keep the original receipt. 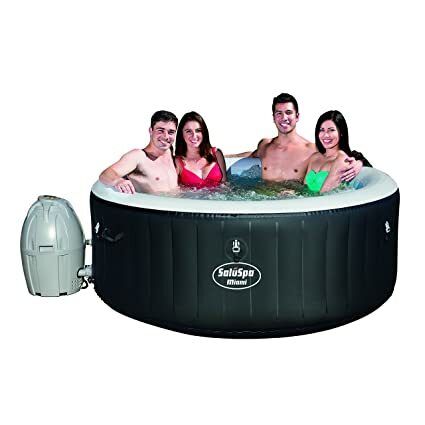 Customers who have purchased and used this inflatable hot tub have generally enjoyed it and its uses. Quite a few customers noted that it was easy to set up as well as drain, deflate, clean and put away. However, several customers stated that they had issues with a defective digital panel. It was easily remedied as a replacement was, in most cases, quickly sent. But dealing with the customer service seemed to be a bit of a hassle as the customer service team primarily did not speak English well. A lot of correspondence is apparently done through email which eliminates some of the language barrier, but some have noted that it takes longer to resolve. Another great option to consider is our Bronze Pick, the Bestway Lay-Z-Spa Miami Inflatable Hot Tub. It can hold up to four people in it and measures in at 71-inches by 71-inches by 26-inches – another large, round inflatable hot tub. This inflatable hot tub has a rapid-heating and water filtration system. It’s made up of the same TriTech material as the Coleman Lay-Z Spa. This TriTech construction has a 3-ply reinforced material that has a polyester mesh core that is encased in two layers of laminated PVC. Because of this, it offers superior strength and durability. Also, again like the Coleman Lay-Z Spa, the Bestway Lay-Z-Spa walls are constructed with the extra durability and strength of the puncture resistant material and special I-Beam construction. These features allow for you to sit on the walls without worrying about them concaving or collapsing on you. The Bestway Lay-Z-Spa Miami Inflatable Hot Tub comes with an insulated cover, a twin pack of filter cartridges and a chemical floater. Also it comes with an easy to follow maintenance guide and instructional DVD that help making the set up a breeze.You can use the Bestway Lay-Z-Spa both indoors and outdoors. Again, this is great if you have a room you are making into a spa and can be used year round, or if you just wish to have it for outside use. Our more budget friendly pick is the Opar Foldable Adult Spa Inflatable Bath Tub. This cute individual-use tub measures 16.4-inches by 14-inches by 5.2-inches. This spa is made with PVC and has a honeycomb structure. This means the bed is more stable and it allows for better ventilation. The bottom is slip proof so you won’t instantly fall on your backside when you slide in. The water proof flocking surface is soft and comfortable as well as easy to clean. The 3-demensional honeycomb design keeps close to your body and the zipper bed cover keeps the heat of the water inside. This inflatable hot tub/bath tub comes with a big-mouth multi-function valve and double airlock design. This is a durable design and makes for a tighter, more leak-proof area. It has no bubble jets and is meant for just relaxing in the warm water. The thick mold welding of the seams is welded at high frequency so they are stronger and less likely to split.Included with the spa is an electrical pump to blow the tub up. The electrical pump is said on the box to be 220volts, however, like many Asian outputs, the pump is a dual power plug and will work in the more common for the U.S.A. outlets of 110volts. The Opar Foldable Adult Spa Inflatable Bath Tub comes with a 2-year warranty. Finding specifics about the warranty, however, may be difficult. This is because customers have noted that everything from the details on the box to the instructions are not written in the English language. 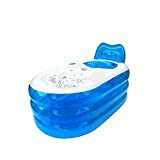 With that said, customers who have reviewed the Opar Foldable Adult Spa Inflatable Bath Tub seem to really like the product. 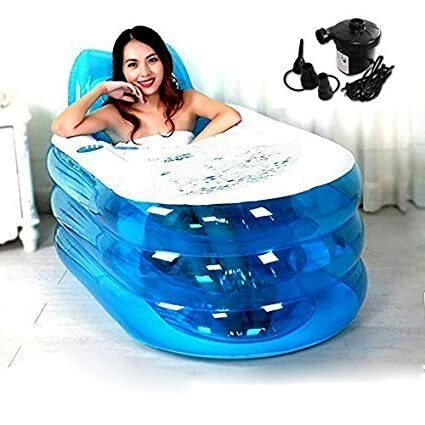 It was noted that the inflatable hot tub/bath tub, as the title implies, is more like a substitute bath tub than a spa as you just soak in the warm water you fill it with. Customers noted that it is very small (as can be told by the measurements above) and not able to be used by larger individuals. When you go to purchase your inflatable hot tub, it’s very important to take into consideration what materials were used to make it. Inflatable hot tubs, bounce houses, anything that is made as an “inflatable” product, is simply just contained air, thus making the product a little more vulnerable than your hard plastic or metal products. This, however, in no way makes them any less effective or enjoyable.Knowing what plastics are used – their strength and layers – to contain the air that fills your product is important information. You’ll want to know if the material is puncture resistant, if the seams will split easily, if the plastic will crack in certain weather, etc. Being mindful that all inflatable products leak a small amount of air all the time, do your research on how well the product is put together so that, that small amount of air leakage doesn’t quickly become a more significant one.Also, you’ll want to know what technology, if any, is used within the side wall(s) materials. Are they strong enough for a person to sit on? Will they concave the wall if too much weight and/or stress is put on them? So on and so forth.Knowing the materials used for your potential inflatable hot tub, and their quality is essential to the productivity, as well as longevity, of your decided purchase. Considering the size and the holding capacity of your future inflatable hot tub is another thing you should take into consideration before you purchase. If you’re looking for a hot tub to be use singularly used for yourself, then it bares to reason that a smaller inflatable hot tub will suffice and work well. However, if you wish to use your inflatable hot tub for get together gatherings where other’s will be joining you, then a larger size with a greater holding capacity would obviously be needed. Check the dimensions of your possible choice, how many gallons of water the tub will hold and the number of supposed capacity. From the reviews above, removing one from the manufacturer capacity suggestion might be in your interest – unless you and your guests don’t mind being more snuggly positioned. Another thing to consider when you are going to purchase your inflatable hot tub is where you plan on using it and what you plan to use it for. Will you be setting your future inflatable hot tub up on your deck outside or down in your basement? Will you be relaxing to music or throwing a frat party? The reason it’s important to take these things into consideration is because they could equate to more equipment needed than what is supplied in the box. For example, if you’ll be putting your inflatable hot tub out on your patio/deck for year around use, you might need to consider purchasing a thicker, more durable under pad than the one provided and maybe even a more heavy duty cover. If you plan on using the inflatable hot tub for children’s swim parties, you may need to invest in more patch-up plastic pads than the one provided. Thinking about where and what you plan on using your inflatable hot tub for before you purchase could save you time and money on your overall purchase. It is also important to consider what type of maintenance your inflatable hot tub will need throughout your time using it. You’ll want to know what is needed to keep your inflatable hot tub running in top condition, and what kind of time and money you can contribute that need. Will it need special chlorine and chemicals to keep the water clean? Does the motor require more electricity to make it run? Will you have drain and refill it on a monthly basis? These, and others, are questions you’ll want to ask yourself when you’re going to purchase your new inflatable hot tub. Whether you plan on using your future inflatable hot tub to sit back and relax by yourself or using it for summer-time pool parties with quite a few people climbing in and out of it, or possible even for both occasions, knowing what to consider before you purchase will save you time and keep you from unwanted stress. Knowing what materials are used to create your choice inflatable hot tub, and the quality of those materials, will keep you from buying a poorly made product. Keeping in mind how many people you are willing to allow to use your inflatable hot tub at any given time will matter on what kind of size and holding capacity you’ll want to have. 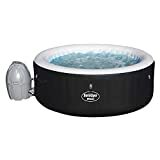 Knowing where you’ll be putting your future inflatable hot tub, and how you plan on using it the majority of the time, also needs to be considered before you purchase so you don’t buy something that has the opposite uses for you needs. Lastly, understanding what kind of maintenance is needed to keep your choice pick running at top notch needs to be addressed so you aren’t purchasing a product that requires more than you’re capable, and/or willing, to give to it.Even if our top choices aren’t exactly what you’re looking for, hopefully the information here will have at least provided you with a better knowledge on what you want to look for in your future inflatable hot tub. Have fun with it and have a relaxing time.